Ultimate Sporting News: Mursak's the man! 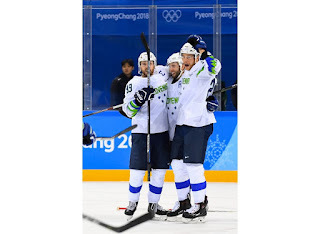 To open the 2018 men's tourney, Slovenia rallied from a two-goal third-period deficit to edge the U.S. 3-2 in overtime. Jan Mursak got the winner at 0:38. U.S. defenceman Matt Gilroy blocked Rok Ticar's first attempt to send the puck cross-ice to Mursak, but not the second one, and the Slovenian captain beat U.S. goalie Ryan Zapolski to the stick side. It was Mursak's second goal of the night. "I'm happy I was able to score today and help the team, but I think the whole team showed a really good performance today," said Mursak. Slovenia surprised everyone at the 2014 Olympics by finishing seventh, and it looks like they're planning to build on that history. This exciting upset was the first Slovenian win over the U.S. in Olympic history. The U.S. won 5-1 in Sochi in 2014. "They came out hard, they came up with a little more fire," said Greenway. "They were down 2-0 going into the third and we just didn't find a way to finish the game "
"We can play with them," said Gregorc. "It was no problem. We just said that we just need to stick together and just fight until the end." "The best part of the beginning of the game was we were pursuing pucks, hunting pucks, and putting the D in tough situations," said O'Neill. "It was exciting to get my first one under my belt, but it would have been much better to get a win tonight," Greenway said. Gregorc, a two-time Olympian who plays for HC Hradec Kralove, cut the deficit to 2-1 at 5:49. The defenceman stepped in off the right point to whiz a wrister through traffic past Zapolski's blocker. Slovenia came close to equalizing with U.S. captain Brian Gionta in the box for tripping. Verlic, parked on the doorstep, banged a rebound through Zapolski's pads just wide of the post. The Slovenes pulled their goalie for the extra attacker with a late faceoff in the U.S. end, and it paid off. With just 1:37 left, Mursak pivoted to whack the rebound from Gregorc's point shot past Zapolski and tie the game. "Hats off to them," said O'Neill. "They played really well in the third period. They did a lot of things well that we were doing well in the first two periods. They kind of turned the momentum around there when they got that first goal and they didn't let up." The Los Angeles Kings veteran, who led the playoffs in scoring during his 2012 and 2014 Stanley Cup runs, isn’t here – but he wasn’t even Slovenia’s scoring leader in 2014. That was forward Ziga Jeglic (4 points), who's back for 2018. Kopitar was one of four players tied for second (3 points). "Of course we can celebrate a little bit but we have a lot of games ahead of us," Gregorc cautioned. Slovenia's next game is Friday against the Olympic Athletes from Russia. The U.S. takes on Slovakia that day.